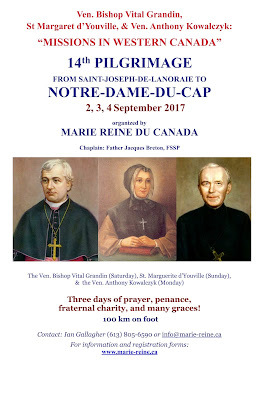 The Marie Reine du Canada pilgrimage will take place this year from September 2nd to the 4th; this a great opportunity to participate in the North American version of the annual Chartres pilgrimage, and see some of sites and historic churches of Catholic New France. Marie Reine du Canada, a lay-led apostolate of St Clement Parish in Ottawa, organizes the annual three-day 100 km pilgrimage on foot from Saint-Joseph-de-Lanoraie to Notre-Dame-du-Cap shrine at Cap-de-la-Madeleine, Quebec. Priests of the Fraternity of St. Peter celebrate Mass each day of the pilgrimage in parish churches along the route: in Berthierville, Yamachiche, and in the historic Small Shrine of Our Lady of the Cape at Cap de la Madeleine, with the blessing of the Bishops of Joliette and of Trois-Rivieres, and the local parish priests. Two priests are normally available to hear confessions in French and English throughout the pilgrimage, whether en route, in camp or before Mass. Click the poster to enlarge, and feel free to share it.